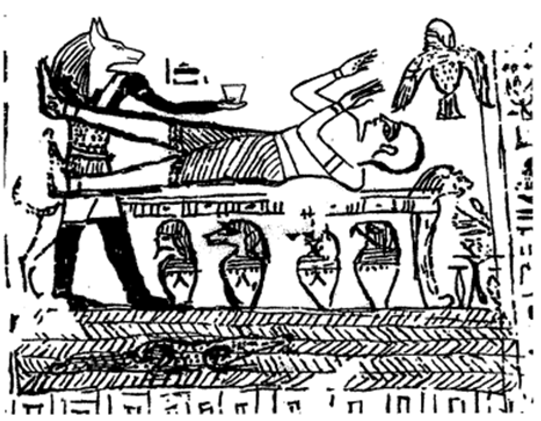 Michael Chandler purchased some mummies from Egypt and took them on a tour in the United States. With the mummies were a few scrolls with Egyptian writing. His tour came to Kirtland, Ohio in 1835 where the scrolls got the attention of Joseph Smith. Joseph purchased these for an amount equivalent to about $30,000 in today’s dollars. Joseph claimed these scrolls had the writings of the Book of Abraham and Book of Joseph (son of Jacob/Israel). He translated the Book of Abraham and published it in 1838. The Book of Joseph was never finished. The Book of Abraham translation came at a time that Joseph was really big into language study. He was very interested in Egyptian. The Rosetta Stone was found in 1799, which enabled scholars to eventually piece together the logic to start translating Egyptian and now modern scholars can translate Egyptian. But in Joseph’s time, it was still a mysterious language that was considered untranslatable by scholarly techniques. The scroll that Joseph used to translate the Book of Abraham was found in a museum in 1966. The translation shows that it was a common funerary text that Egyptian nobles were buried with, giving instructions and requests to the Gods for the dead person in the afterlife. It had nothing to do with Abraham. It was called The Book of Hoth and dated to about 200 BC. Abraham would have lived about 2,000 BC. 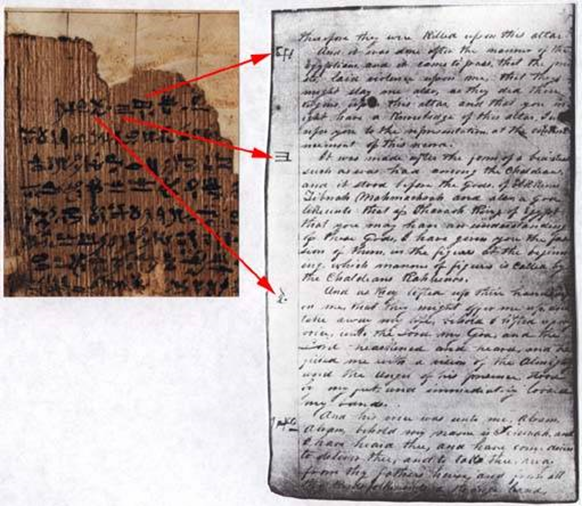 Joseph Smith started the Kirtland Egyptian Papers project in 1835 when he began translating the Book of Abraham. This was essentially an attempt to crack Egyptian using the revelatory process, creating an Egyptian/English dictionary. 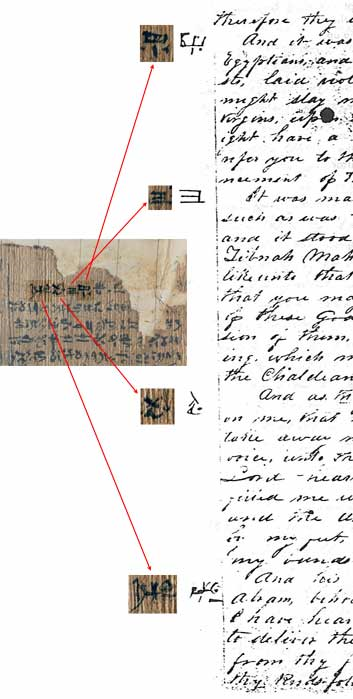 This is a fascinating look into the process Joseph used to try to understand Egyptian. Historians and analysts have taken the KEP from Joseph’s records and the scroll as found in 1966 and piece together Joseph’s process of translation. This illustration shows the main scroll, earlier thought to be destroyed in the 1871 Chicago fire, but which surfaced at the New York Metropolitan Museum of Art in 1966. In the image below, on the left is a piece taken from the yellow rectangle above. On the right is a portion taken from the KEP. The arrows show the mapping from the Egyptian symbol to the KEP. In the KEP, to the right of the Egyptian symbol is the text that Joseph took as the translation of that character. 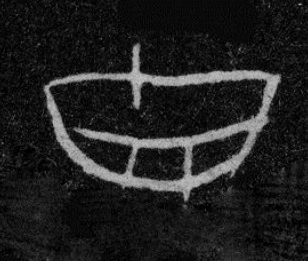 In the image below, going down, vertically, the first two symbols are real Egyptian characters, existing in the version Joseph had but since damaged and illegible. Then we have a portion of the scroll that was apparently damaged and missing when Joseph received it. We can see that he inserted four characters. The first was a real Egyptian character he copied from another section. The next three are symbols look like they might be Egyptian but are not. Joseph apparently invented these using his imagination. After these three, we get to the characters shown in the second image above. In summary, what we have here is the Egyptian from the scroll, lined up with the Book of Abraham text, in a way that it appears someone thought it was a direct translation. Two issues with this. 1) It wasn’t a proper translation. 2) The KEP authors must have severely overestimated the efficiency of Egyptian, ie the ability to cover a lot of meaning with one character. For example, the Egyptian character for “water” was misunderstood to cover two entire verses of the Book of Abraham. This misunderstanding also might relate to the issue of the Gold Plates being large enough to house the Book of Mormon, the lost 116 pages, and the untranslated sealed portion. The KEP is not written in Joseph’s hand. Many of the early church leaders were involved: W.W. Phelps, Warren Parish, Oliver Cowdery, etc. This was the School of the Prophets time period when they would meet together to study various subjects that had crossover between the secular and spiritual realm. It’s argued by some LDS scholars that the KEP wasn’t tightly managed by Joseph Smith and prophetic authority, and it may not have been involved with the translation. ie the translation might have come first adn the KEP was a misguided attempt to “back fit” the translation onto the Egyptian text. 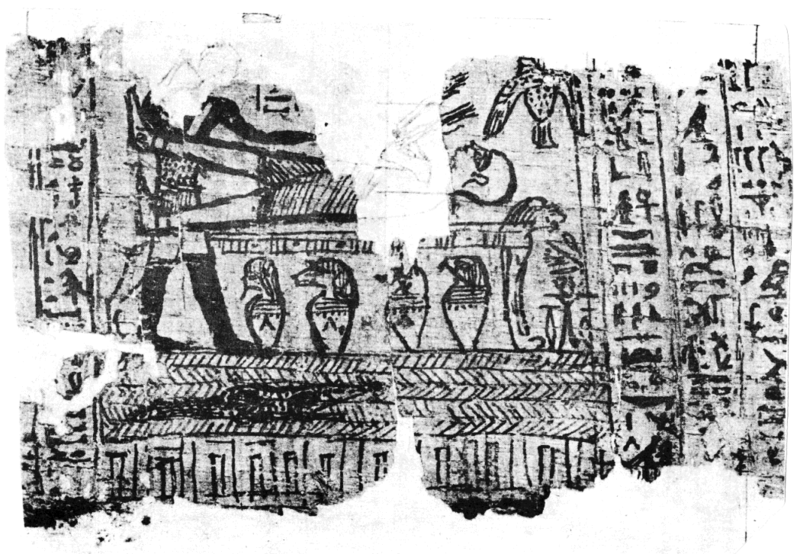 This is Facsimile 1 found with the scroll just to the right of the KEP/Book of Abraham translated portion. You can see that pieces are missing, and you see the hand sketches made by someone involved with Joseph in KEP project in 1830’s. It appears Joseph reconstructed the missing parts and interpreted the meaning as Abraham being nearly killed by an Egyptian priest before being rescued by the Holy Ghost. 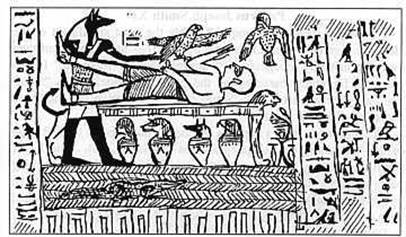 This is the image taken from the Book of Abraham that Joseph published, still found in LDS scripture. 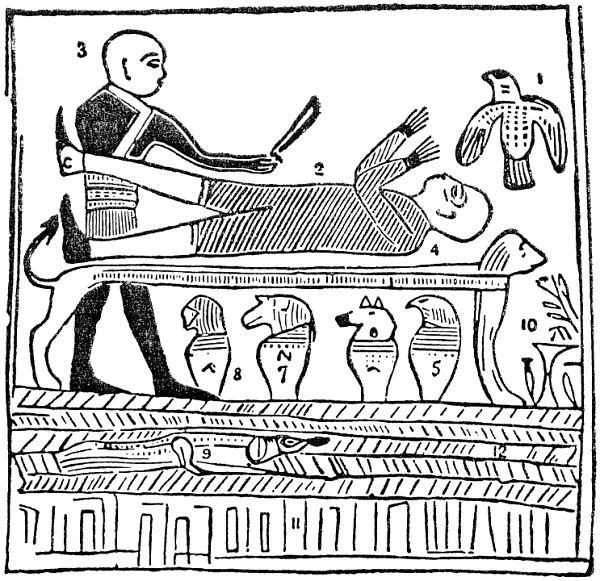 The following are two reconstructions of the facsimile by trained Egyptians. The characters and the scene are typical for Egyptian pictures. Egyptologists agree generally on the meaning. This is to represent the Egytian god Horus (jackal head) offering up the buried dead to heaven. The other facsimiles have similar kind of issues. In summary, again what we see here is that the scrolls Joseph used to translate the Book of Abraham have survived, and we have enough information (ie the hand written portion) to piece together the logic of how Joseph likely viewed the scroll, and it doesn’t match up with the actual Egyptian or how the scrolls likely were originally used. In 1843, some men fabricated some ancient looking stone plates with Egyptian looking writing on them and offered them to Joseph Smith to trick him. 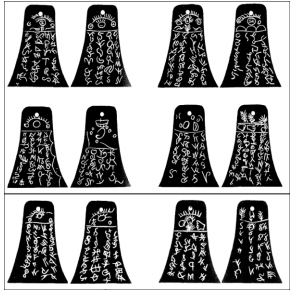 These are called the Kinderhook Plates. By a couple different accounts, Joseph put them on display in his house, declared them as being a record from a Jaredite and started to translate them. I don’t think this particular episode is that impactful in the larger picture of determining whether Joseph had the ability to translate ancient records. But what I think is very interesting is the insight it gives into the prior Book of Abraham translation, and Joseph’s thought process when it comes to translating Egyptian. Don Bradley, LDS scholar, presented some fascinating research where he tied the accounts referencing the Kinderhook Plates with the actual KEP. 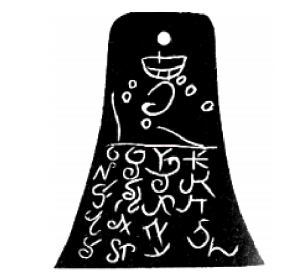 He found a section in the KEP English translation side that matches the alleged translation of Kinderhook Plates taken from the first symbol at the top of the second Kinderhook Plate. 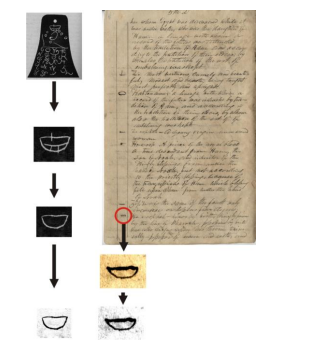 Don Bradley’s theory, which appears very likely, is that Joseph took the Kinderhook Plates, and recognizing the first character at the top of one of the plates (the boat shape), matched it up with the KEP, and began, at least a very rudimentary level, a translation. Scripture is seen as metaphorical. Faith is an expression of loyalty, devotion, worship and doctrinal alignment but not necessarily a belief in the factual accuracy of scripture or historical religious origins. Challenges to scriptural historical events are not damaging to faith. I do not believe the papyri contained the writings of Abraham. I believe Joseph Smith was inspired by God to bring forth the restoration of the gospel, and he believed as a prophet he had a right to write the words of Abraham, in midrash style. Some scripture is more valuable than other. I believe Joseph felt called to be a prophet, but it’s possible he made mistakes in an attempt to bolster his credibility to others to execute the plan he felt deeply was his responsibility. I believe the fruits of Joseph’s work are true and beautiful. Some members are still in the “missing papyri” camp, ie the papyri that was found was missing portions. That could have been what Joseph was translating. It is not uncommon for writings to be passed down, and transcribed and combined with other writings, so it’s not impossible. They believe there are “bullseyes” related to Book of Abraham content that are remarkably similar to writings attributed to Abraham that Joseph would not have known about. Many literal believing members fall into the “catalyst” camp. The writings of Abraham were not on the scroll, but Joseph used the scroll to tap into the revelatory spirit, channeling an actual ancient record Abraham did write. The KEP shouldn’t condemn Joseph as it was a completely separate endeavor. Joseph first translated the Book of Abraham by the power of God. He then tried to use the translation as a way to figure out the Egyptian, which didn’t work and which might have been more focused on by some other men like W.W. Phelps. The actual reality lies somewhere in between the two above views. The catalyst theory or the midrash theory is fine with many members. Some might go so far to say Joseph intentionally misrepresented the papyri; some might think he misunderstood what the papyri were. But what ultimately is important is the doctrine and teachings that came as a result of Joseph’s prophetic role. We accept The Book of Abraham as the word of God as part of the canon of this church. By studying it, we can find value in our efforts to worship God, and we can gain insight into the revelatory process of a prophet.